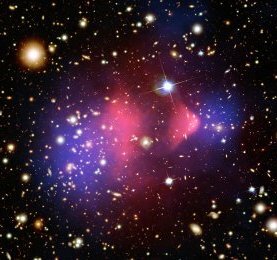 False color image of the Bullet Cluster: Dark matter (blue) and visible matter (red) have been separated in the collsion of two galaxy clusters. Today, we have striking astrophysical evidence that dark matter exists. The dark matter played a major role in the structure formation in our Universe, and keeps the stars and gas in our galaxy from flying apart. Is not made out of the particles described by the Standard Model of Particle Physics and does not emit electromagnetic radiation (therefore we cannot "see" it). Based on theoretical arguments, it is believed that it interacts with normal matter only via the weak interaction (apart from its gravitational effects on astronomical scales). The dynamics of galaxy clusters. The mass of galaxy clusters that act as gravitational lenses is much larger than the visible (in the whole spectral range) amount of stars, gas, and dust. The analysis of the angular power spectrum of the fluctuations in the cosmic microwave background (CMB), measured by WMAP and PLANCK, allows the precise determination of fundamental cosmological parameters, such as the dark matter abundance. 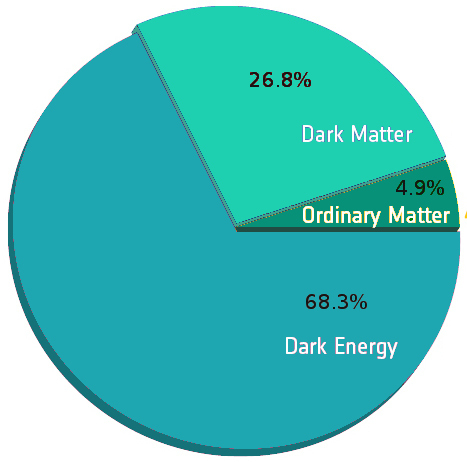 68.3% Dark Energy, the energy content of the empty space. This component is responsible for the observed accelerated expansion of the Universe. Besides baryonic matter (atoms etc. ), the Universe consists of Dark Matter and Dark Energy. The latter two make up about 95%. We know that dark matter builds gravitationally bound clumps, and that is is a key ingredient to understand the evolution of the large scale cosmic structures and of galaxy formation. It has to be made of electrically neutral, massive particles that interact only gravitationally and maybe also via weak interactions. Such Weakly Interacting Massive Particles (WIMPs) have not been discovered yet, but many experiments around the globe are trying to find the WIMP either directly (like the DARWIN project), or indirectly by searching for rare WIMP annihilation processes in the Sun or in the Galaxy. Dark matter particles might also be created in high energy collisions of the Large Hardon Collider at CERN. This idea is strongly supported by supersymmetric extensions of the Standard Model (SUSY) that predict many new particles with masses and interactions around the weak scale. The lightest SUSY particle (in most theories the so-called neutralino) is predicted to be stable, massive and neutral, and is therefore a compelling candidate to be the WIMP.